Clinical Command Centres provide support from medical specialists for complex cases through HL7, DICOM, HIPAA (among others) compliant information & telemedicine systems. MobileCare™ is a holistic solution addressing healthcare delivery issues in rural areas. It integrates with current healthcare infrastructures and optimizes the scope and efficiency of care by delivering higher standards through technology. What does the MobileCare™ include? Telehealth is the use of information and communication technology to deliver health services, expertise and information. It integrates eHealth with advanced diagnostic video conferencing to enable patient-physician/specialist interaction over unlimited distance in real-time. Kallo's customized mobile clinics are linked via Telehealth to response centers (Clinical and Administrative) where specialists provide secondary or tertiary support, addressing a lack of professional resources in rural areas. Explain how the ‘lack of professional resource in rural area is addressed’ by MobileCare™? Kallo MobileCare™ medical clinics are custom designed to provide comprehensive health care services to remote areas. Trained and certified staff is able to perform tasks not usually performed by technicians (like cannulation, cardiac monitoring, intubation etc.). They have access to the onboard “state of the art” medical equipment and technology. The telehealth systems enable them to access diagnostic, surgical, and technical guidance form specialists at Clinical Command Centers, located at the nearest teaching hospital. Specialists now become available to patients in remote areas, thus reaching the unreached. Mobile clinics are equipped with a hybrid communications system, which automatically switches between RF and satellite infrastructures. The system optimizes data exchange, minimizes latency, reduces human intervention and system downtime while saving operational costs. What medical specialties does MobileCare™ offer? MobileCare™ is an entirely customizable solution that accommodates the healthcare needs of any region. Apart from acute care, these include specialties like maternal care, dental care, dialysis, chemotherapy, HIV/malaria monitoring and treatment, etc. How robust is the mobile clinic? After a thorough analysis of local geographical and environmental conditions, Kallo architects the mobile clinics on heavy-duty axels. Due consideration is given to special reinforcements (like dustproofing, suspensions/transmission, RF shielding, positive/negative air pressure, biomedical waste disposal, storage, air conditioning/heating, power generation/backup, etc.) ensuring Kallo mobile clinics are superior to modified trailers or motor-homes. How does the medical equipment withstand the terrain? Medical equipment used in Kallo mobile clinics is different from that used in hospitals. Kallo works directly with manufacturers to ensure pre and post-production ruggedness of the equipment, installation, testing, on-going maintenance and calibration. This is a rigorous and thorough process managed by Kallo’s biomedical engineers. Is it safe to perform surgeries onboard the vehicle if required? Yes, the examination/procedure rooms transform into an aseptic environment in a matter of minutes to minimize pathogenic contamination. Strict adherence to aseptic techniques in clinical practice will ensure the ability to perform other procedures like wound care, drain removal and drain care, intravascular procedures, vaginal exams during labor, insertion of urinary catheters, respiratory suction, etc. How different is the examination/procedure room from those in hospitals? Kallo mobile clinics have two examination/procedure rooms equipped with ultrasound, retinal imaging, stat blood test equipment, ECG/defib, medical gas making it equivalent to any minor surgical rooms in a hospital. Furthermore, the advanced telehealth system allows for one surgical team from the Clinical Command Centre to provide services to multiple mobile clinics. Can MobileCare™ be used in cases other than curative and palliative? Yes! Since the leading causes of global mortality are all preventable, MobileCare™ is especially advantageous for an effective implementation of preventative care strategies. Kallo mobile clinics are able to provide the delivery of vaccinations for immunization initiatives, as it is mobile and can maintain a cold chain. The EMR serves as a registry for specific public health initiatives and follow-up. MobileCare™ functions independently or within a population health model. Have you considered cold-chain and blood collection/donation services? Kallo Mobile Clinics have cold-chain systems and equipment for blood screening, such as haemonetics and deepfreezes, accommodating blood and vaccine storage. Patient stabilization areas can be used for blood collection and transfusion. Kallo Clinical Transformation Team, consisting of doctors, nurses, bio-medical engineers and in collaboration with Canadian and US academia, has developed specific training programs for MobileCare™. Frontline medical officers are trained on the use of onboard equipment and industry best practices including procedures and protocols. Nurses are provided continuous medical education in areas such as monitoring and tracking vital signs, IV placement, phlebotomy, administration of medications, etc. Bio-medical engineers train local technicians on installations, repairs, calibrations, maintenance and inspection of all technical equipment. Mobile clinic operators ensure safe operability, availability of medical consumables and power supply. They are also trained to perform level 1 equipment troubleshooting and to oversee transformation of the clinic into an aseptic environment. What about ongoing training, service and maintenance? Good outcome measurements are obtained if staff is well trained, clinics are maintained, consumables are replenished and bio-medical waste is well managed. To this end, an ongoing Kallo training and maintenance program is mandatory. The purpose of mobile clinics is to reach the unreached. There are many examples of mobile clinics parked, stranded and unable to deliver healthcare to rural communities. Efficient functioning of a state-of-the-art mobile clinic in rugged conditions can only be achieved through regular maintenance, service and on going training. Making this mandatory is a natural progression when the commitment is to increase the availability of healthcare in remote areas. How is Kallo maintenance/service different from that of other medical equipment and mobile clinic manufacturers? Medical equipment and other mobile clinic manufacturers void warranties if technicians other then their own attempt to service/maintain the equipment. This results in delayed service times and high down time. Kallo’s tiered and integrated maintenance/service is proactive. Periodic remote monitoring/calibration of equipment and the mobile clinic ensure minimum down time and better healthcare delivery. Level 1 – Biomedical engineers and technicians from the Ministry of Health/ Regional Health Services who are trained by Kallo Clinical Transformation Team. Level 2 – Regionally located Biomedical engineers and technicians employed by Kallo. 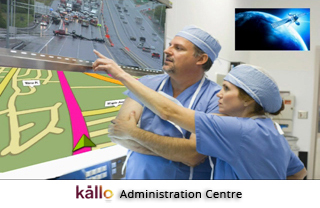 Level 3 – Biomedical and technical support from Kallo offices in United States and Canada. What about replenishment of spare parts, consumables etc.? Spare parts, medical consumables, and other supplies are inventoried at Administration Centres. Vehicle maintenance, replenishment of consumables, travel routes and staff rotations/requirements are coordinated from here. Administration Centres are supported by Kallo through strategically placed regional offices. Can you do on-route replenishment of consumables, linens, pharmacy items, vaccines, medical gases, water, fuel and the disposal of clinical waste? Yes. Kallo’s MobileCare™ program includes utility vehicles designed to carry consumables and other supplies to the mobile clinics functioning in remote areas. These utility vehicles also have cold chain storage and medical waste disposal systems. Kallo MobileCare™ – Reaching the unreached.